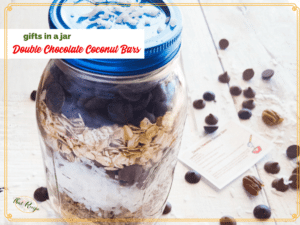 This Double Chocolate Coconut Bars Mix is a simple gift you can make at the last minute. I made a few of these up at the last minute as gifts for some of the aides at the school. I figured they would be overloaded with other sweets so they could store this until they needed a quick chocolate fix. You can write out the directions or print these to attach to the jars. Layer ingredients in a quart jar in the order listed. Attach the instructions. Preheat oven to 350 degrees. Put butter in a 9 x 13 pan and place pan in the oven until butter melts. In a large bowl combine condensed milk and cookie mix, spread in 9 x 13 pan. Bake for 20-25 minutes. Cool for 5 minutes, then cut into squares. Let cool completely. 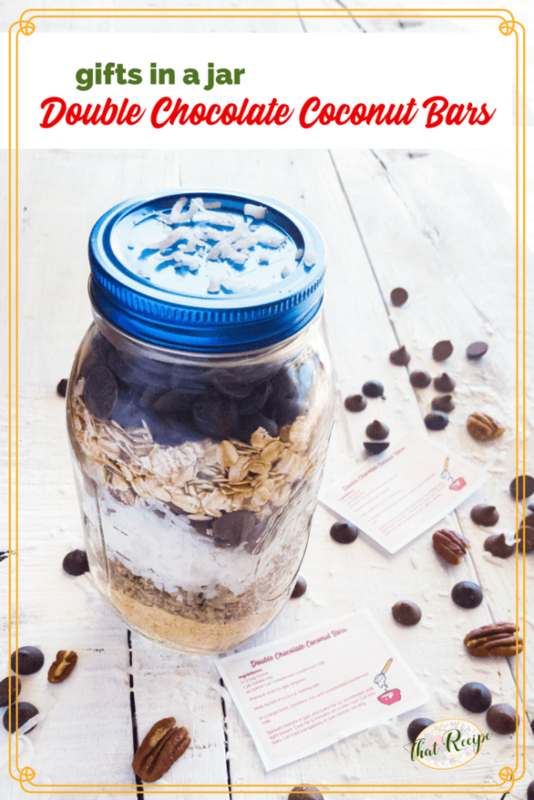 You can print these labels to attach to the jar.